OCS seventh grader Micah Fitch earned 1st place in the ACSI District Math Olympics. 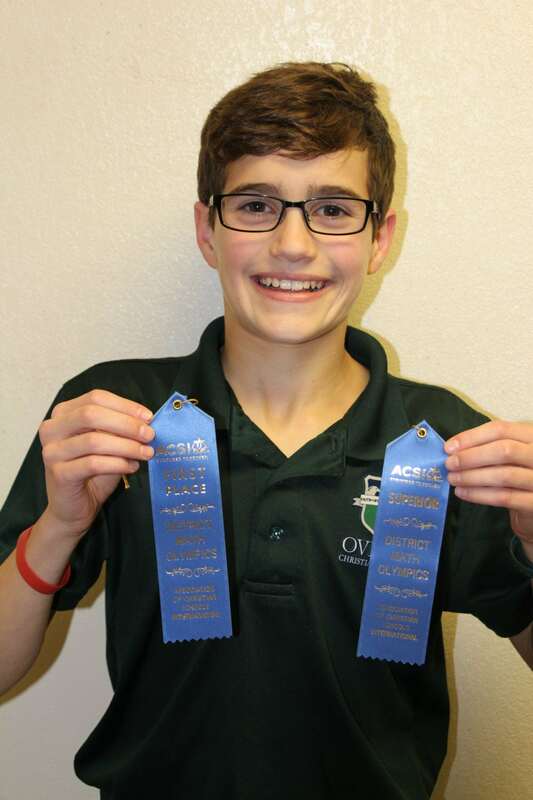 OVILLA—Ovilla Christian School has an unprecedented 24 of 36 competitors advancing to Area competition in the Association of Christian Schools International Math Olympics. Of those advancing, 22 earned first-fifth place in their competition categories as well. These numbers are even more impressive considering that Ovilla Christian School serves about 400 Kindergarten – 12th grade students. In November, OCS students were selected to participate in Math by Mail at the District level. All students in grades 3-8 are given several practice tests in the classroom and compete with their classmates. Students scoring the best in each category are selected, three for Computation and three for Reasoning in each grade level. “Being selected to do the Math by Mail district competition in November alone is a distinct honor. All of those students are already winners just to make it that far,” Stephens said. Each fall, ACSI offers Math by Mail, a mail-in activity for ACSI member schools designed to stimulate an interest and recognize the achievements of students in mathematics. Students are tested on their campus, then score sheets are mailed to host sites for tabulation and determination of awards. Those scores determined which students then advance to Area.